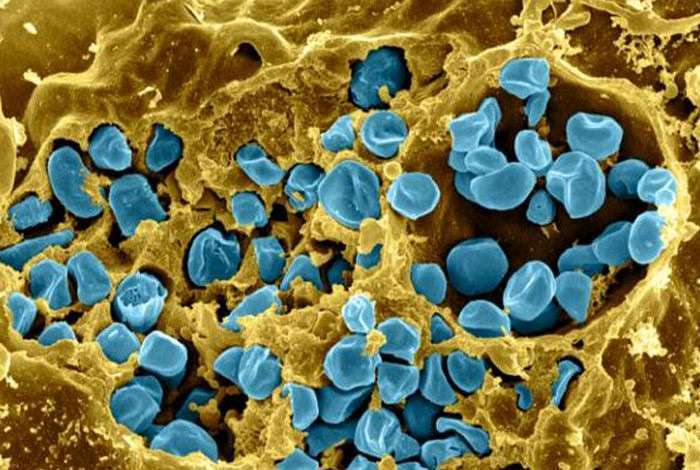 This scanning electron micrograph shows a mouse immune cell (yellow) infected with Francisella tularensis bacteria (blue). Credit: National Institute of Allergy and Infectious Disease. Years later, a Soviet defector claimed that his country had unleashed their stores of F. tularensis on German soldiers, weakening them shortly before the pivotal Battle of Stalingrad. Others believe the outbreak on the German-Soviet front was more likely spread by rats, not Russians. Yet no one has disputed the bacteria's capacity to inflict harm. The Centers of Disease Control ranks tularemia as one of the six most concerning bioterrorism agents, alongside anthrax, botulism, plague, smallpox and viral hemorrhagic fever. And Russian stockpiles of it likely remain. The research appeared early online Sept.1 and will be in the Sept. 13, 2017 journal Genes & Development. "Now we have the coordinates for stopping one of the most infectious agents known to man. By having all of these pieces, and understanding how they fit together, we can design new drugs that can shut down virulence," said Maria A. Schumacher, Ph.D., senior study author and the Nanaline H. Duke Professor of Biochemistry at the Duke University School of Medicine. F. tularensis is an exceptionally hardy organism that can infect a variety of hosts, including humans, rabbits and mosquitos, and can survive for weeks at a time in dead and decaying carcasses. It is so virulent that a person only has to inhale 10 microscopic particles of the bacterium to become infected. The Russians and Japanese, as well as the Americans and their allies, all explored its potential as a biological weapon during World War II. After the war, Russians continued to develop the agent, searching for mutations that could make it resistant to antibiotics and thus even more deadly. The World Health Organization has since projected that 110 pounds of F. tularensis dispersed over a city of 5 million people would cause about 250,000 cases of severe illness, and 19,000 deaths. Despite decades of fervent study, the factors that make this bacterium so pathogenic are still not fully understood. Recently, a cluster of genes called the "Francisella pathogenicity island" emerged that is essential for its virulence. In this study, researchers carried out a battery of structural, biochemical and cellular studies to define the molecular factors that turn these pathogenicity genes on and off. They suspected that a stress-sensing molecule or "alarmone" called ppGpp might play a role. Alarmones are known to respond to stressful conditions by promoting survival and virulence in bacteria. Lead study author and Duke graduate student Bonnie J. Cuthbert started by looking at factors that might interact with ppGpp, such as the aptly named protein pathogenicity island gene regulator or PigR, the macrophage growth locus protein A or MglA, and the stringent starvation protein A or SspA. Cuthbert used a technique called x-ray crystallography to produce atomic-level three-dimensional structures of each of these proteins, and then assembled them one by one, like the components of a circuit board. She found that MglA and SspA partner up to form a two-part protein that contains a unique binding pocket on its underside for ppGpp. Once this molecule is bound, it recruits PigR and subsequently stabilizes RNA polymerase to this area of the F. tularensis genome, creating a large complex that latches onto the DNA to flip on the pathogenicity genes. The researchers then created mutations that destroyed the binding pocket for ppGpp. They found that when the alarmone couldn't bind, pathogenicity couldn't be activated. "We have uncovered a totally novel way for controlling virulence," said senior study author Richard G. Brennan, Ph.D., James B. Duke Professor of Biochemistry and Chair of Biochemistry at Duke University School of Medicine and also an advisor to Cuthbert. "If we could block this binding pocket, then we could stop virulence in F. tularensis. It would be a new way of fighting this bacteria, by disabling it with antivirulence drugs rather than by killing it outright with antibiotics." What makes Francisella such a bad actor?